A former line cook who worked his way to senior management for a large company, Asher Driggers fuses business smarts with streetwise bravado to grow Grifter, now headquartered in a Meeting Street office. A flagship store may be coming down the road. 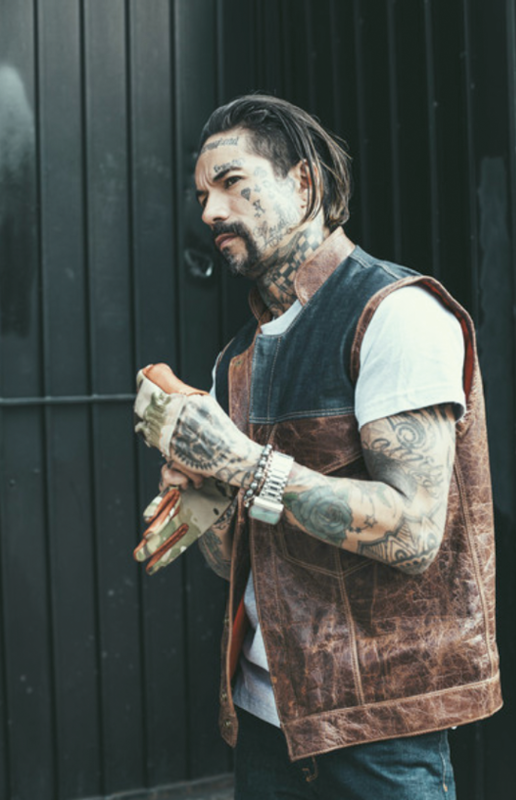 Expertly crafted, American-made gloves, vests, tees, and accessories with attitude—Grifter fills the pothole that Asher kept hitting: “I wanted cool stuff to wear,” the avid biker says. 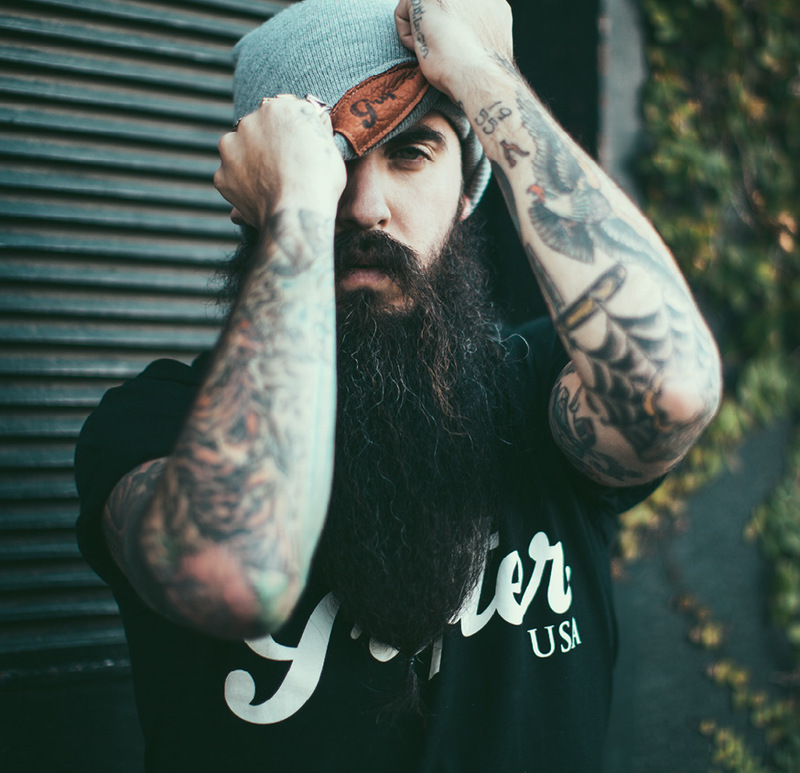 Expertly crafted, American-made gloves, vests, tees, and accessories with attitude.. 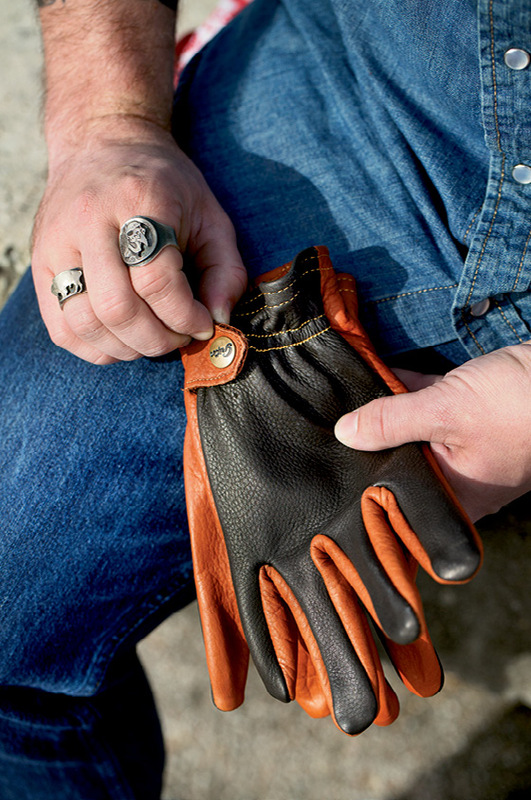 Meanwhile Grifter gloves begin with soft, durable bison leather and hit high-speed style from there. 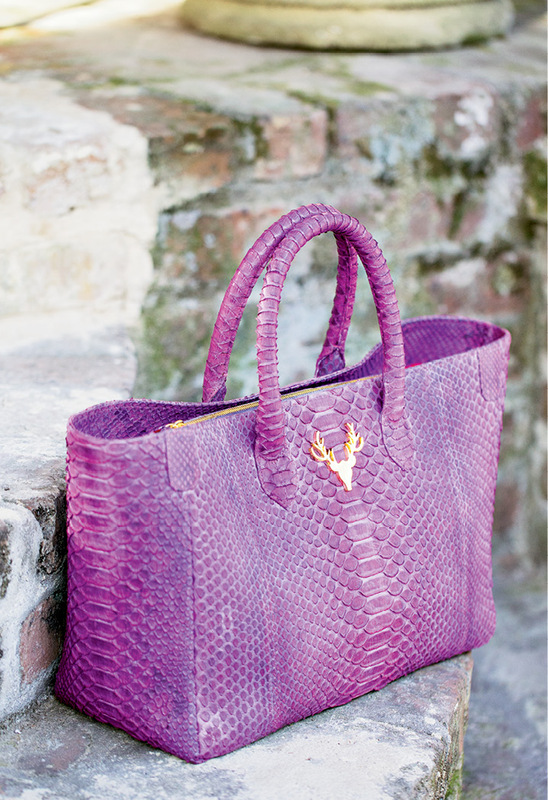 Taxidermy bags add exotic reptile skin and color-shock riff to classic forms, creating take-notice accessories. A dedicated Taxidermy storefront may be in the works, given the success of Amy’s pop-up shop (pictured above) on Spring Street over the holidays. Meanwhile, most clients find her on the Web. One of Amy’s big breaks came when Beyoncé (pictured above hitting the town in her Luxe Chucks) carried an “Antler” clutch (opposite) to a Hollywood event. “When my phone and Instagram were lighting up, a friend told me to just sit back and enjoy this moment of celebrity fame, because it could be over just as fast. But it’s sure fun!” says Amy. She’s high-end and cheeky chic. He’s low-riding and badass. She’s purse and priss; he’s glove and gonzo. She slants reptilian luxe; he toward rogue leather. She’s Amy; he’s Asher, and together they’re proof that opposites not only attract, they attract an ever-expanding fashionista following. Amy and Asher Driggers arrived in Charleston last fall, moving into their West Ashley abode just one week before the 100-year flood. But since then, they have wasted little time getting their feet wet in the local creative community, wowing style setters with their respective, and polar opposite, lines. 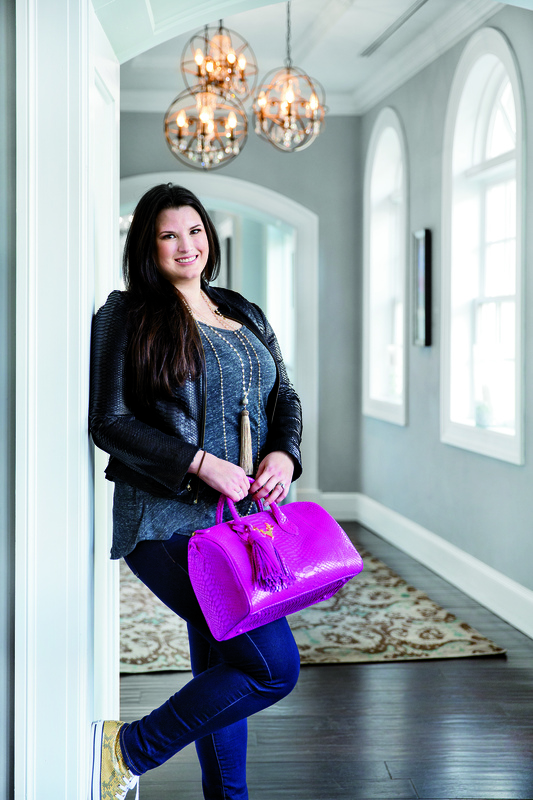 “Our brands couldn’t be more different,” says Amy, whose tony Taxidermy handbags outfitted in exotic, and occasionally neon-tinted, python or lizard skin sell at a premium price point. Asher nods in agreement, sporting a black Grifter hoodie, his company’s logo in a bold retro script. 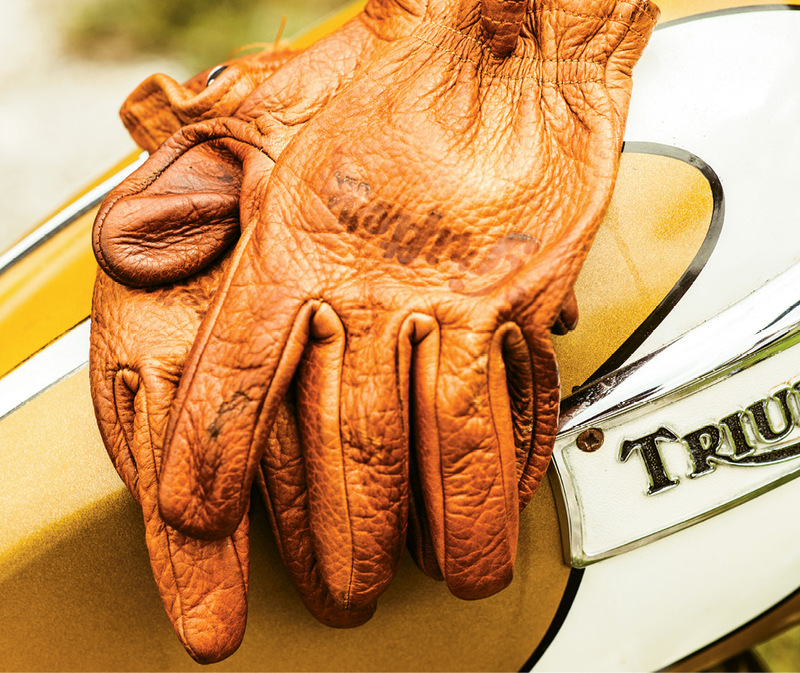 Best known for the “Scoundrel” motorcycle gloves featuring bison leather (one reviewer called it the “toughest thing this side of Keith Richard’s liver”), Grifter Company blends “street-style confidence with vintage bravura,” his tagline says. Asher’s targeting full-throttle biker vroom while Amy courts red-carpet panache, but contrasting styles and markets seems to be working for this young couple. They’re a marriage made in entrepreneurial heaven, or dining room table-as-sample-cutting-hell, or maybe both. 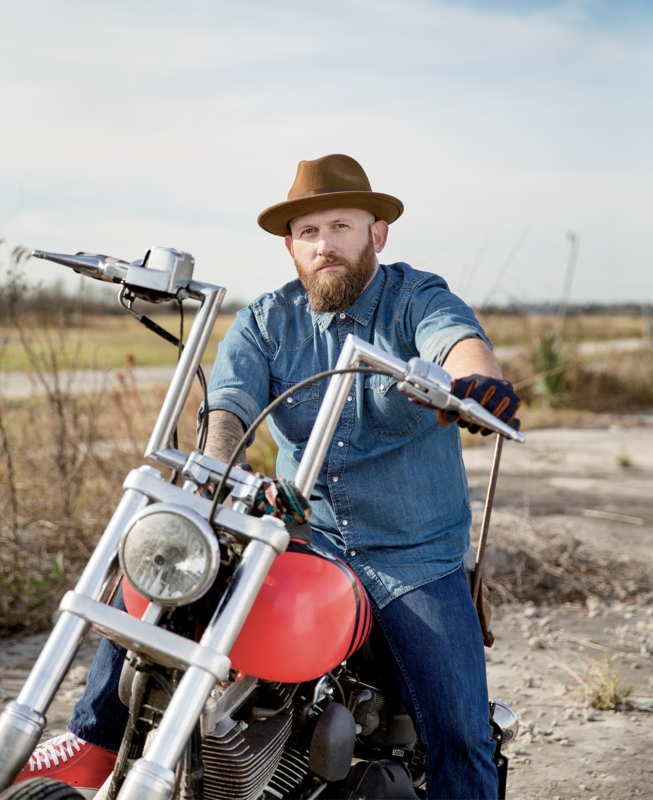 “Still am,” deadpans Asher, also a Clemson grad, who grew up in Greenville, South Carolina, and was a food-and-beverage veteran before becoming a biker dude with a moto-hipster lifestyle brand. 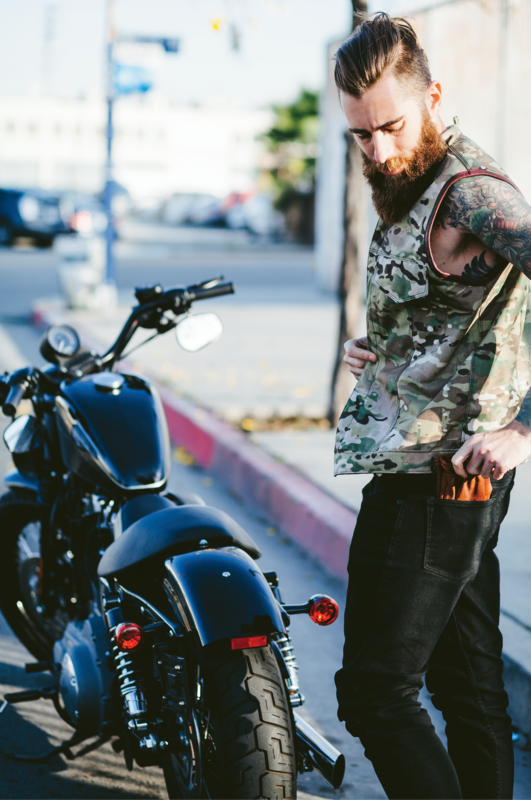 He bought his first Harley a couple of years after college (“Yeah, my mom was really excited about that,” Amy pokes), and that was the creative catalyst, says Asher, who had long nurtured an edgy personal style. “I wanted cool stuff to wear while riding and realized there was a gap in the market that I could fill.” And fill he has, with eye-catching, hard-working gloves, vests, and tees, as well as a few women-specific items. “It’s been nice to share in our big, fun things,” says Amy, like the day her Instagram account blew up when Beyoncé carried a Taxidermy “Antler” clutch to a premiere, or when Asher got serious social media traction from a Maxim interview. “And to share in our mistakes,” she adds, mentioning the time she received three cartons of flawed and unsellable product from an untested supplier in China. Though they were only a year apart in college and had overlapping sets of friends, the two didn’t meet until after Amy graduated in 2004, two weeks before she moved to D.C. But two weeks was enough. “There was definitely an immediate spark. We both pretty much knew that this was it,” says Asher, who spent so much time with Amy during that brief window that his roommates made a “Welcome Home” banner for him after she moved. Four years of long-distance courtship followed, then Asher quit his restaurant cooking gig in Clemson and moved to D.C. in 2007, landing a job managing dining services for a large senior living company. 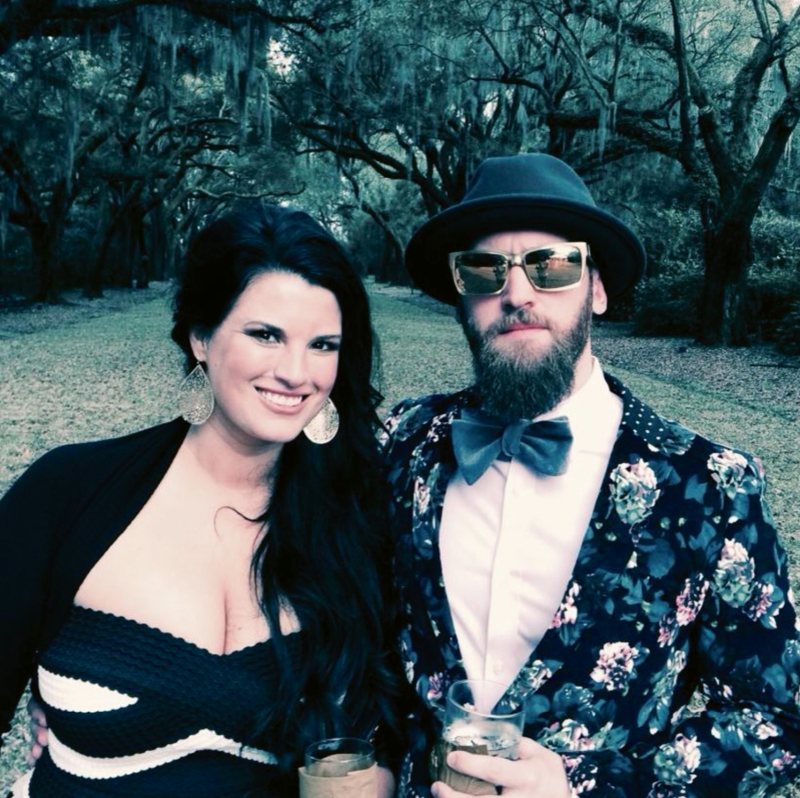 In 2012, they got married in Charleston, a place they had grown to love through regular visits during and after college. “We always knew that eventually we wanted to end up here, but we just didn’t know how we’d do it,” Asher says. That not “knowing how” hasn’t stopped the Driggerses from digging in. They both cocooned dreams of launching their own companies for several years before Taxidermy and Grifter each became a reality. Their first step: a huge piece of white shower board from Home Depot. “I put these two big panels up in our living room, I wrote ‘Grifter’ on one side and ‘Taxidermy’ on the other, and we used it like a whiteboard for brainstorming. It was in our view all the time, unavoidable,” Asher recalls. That was early 2014. Since then, things have evolved quickly for both brands. Amy, who explains that she’s always had an affinity for exotic animal skins (“I just love their texture and uniqueness,” she says), had been toying with ideas related to natural skins and handbags for several years, including a messy, failed attempt at cutting and sewing skins herself. This was while she was simultaneously developing a line of fur garments (capes, jackets, vests, accessories) for her day-job as director of Peri Luxe, a fur wholesale garment line. Through trial and error, Amy landed a reliable source for quality python and lizard skins from a small family farm and factory in Indonesia. The name Taxidermy just came to her, blurted out over dinner with her sister, and it stuck. “I thought it was edgy and cool,” she says. “Yeah, but I didn’t get it for a few weeks,” counters Asher. The deer antler logo she drew herself. “I’ve always thought of handbags as trophies women collect,” Amy explains. 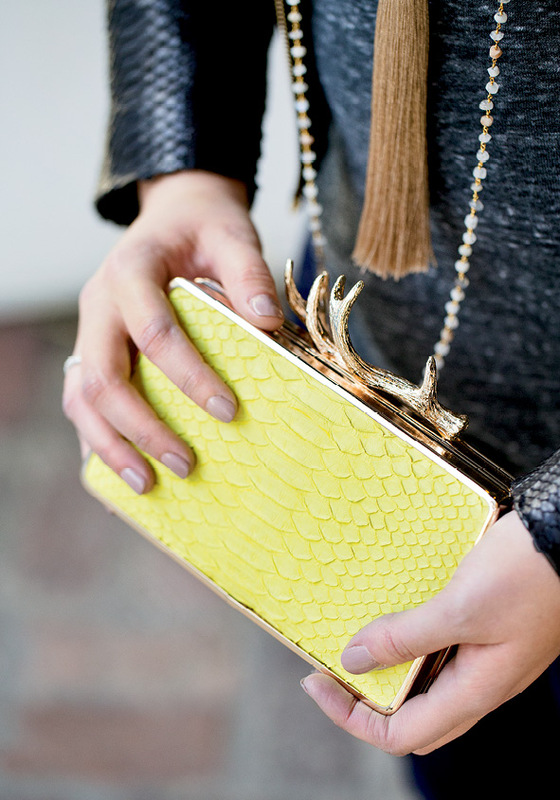 She officially launched with two bag styles—a tote and a clutch—in April 2014. In March 2015, Amy showcased Taxidermy at a trunk show during Charleston Fashion Week®. A blogger for Glamour.com published a blurb; Instagram followers grew; and a few folks stopped her on King Street or in restaurants to ask, “Is that a Taxidermy bag?” “I was so uncool about it, I probably cried and shrieked I was so excited,” she says. 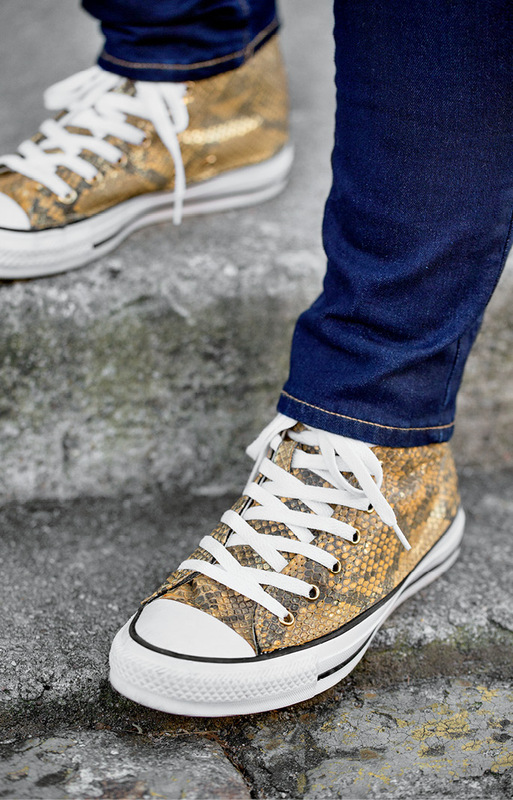 “Guess it was pretty obvious I hadn’t been around long.” Even now, after celebs like Beyoncé and Kourtney Kardashian have been photographed wearing Taxidermy bags or Amy’s offshoot exotic skin-ensconced Converse Chuck Taylors (think python, ostrich, alligator, and stingray) called Luxe Chucks, the excitement never gets old. “To see someone wearing something I created, it’s like Christmas every time,” she says. 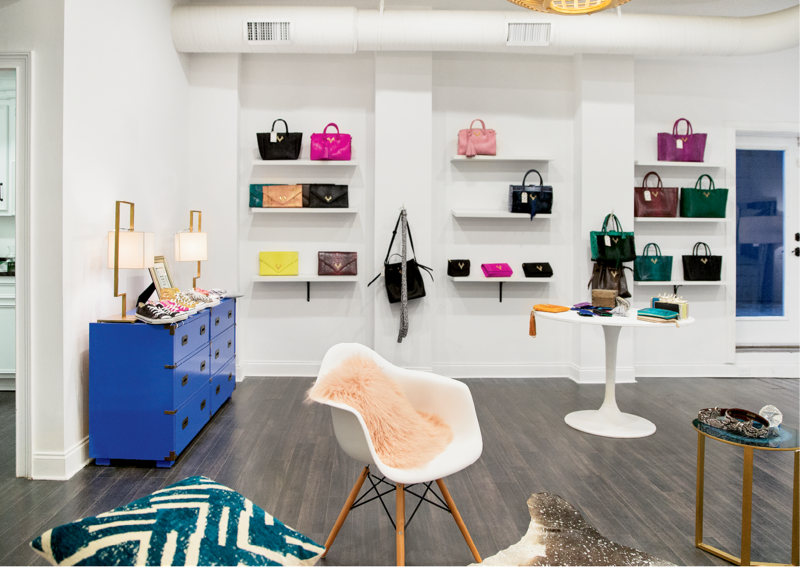 Though Amy was first to market with her bags (Internet sales are her primary portal, plus a smattering of boutiques across the country and a Spring Street pop-up shop over the 2015 holidays), Asher’s hip Grifter line has gained a rapid and steady grip in the “moto-wear” world—a close-knit community and easily targeted marketplace. “He’s bigger than I am…for now,” Amy concedes, pointing out that for most people, an $80 pair of gloves is an easier purchase decision than an $800-plus bag. Currently some 75 retailers, including 20 international locations and four Harley stores on the West Coast, carry Grifter goods. But the product development phase for Asher also had its challenges. After refining his vision for a stylishly functional, non-mass-produced glove, he had to find a quality American (“that was a must”) manufacturer that could accommodate small orders. As with Amy, there was plenty of trial and error, including homespun and haphazard dining room table experiments. Eventually Asher discovered Gloversville, New York—the aptly named city that was once the glove manufacturing capital of the world, back before U.S. mills and textile manufacturers succumbed to cheaper overseas labor. There, Asher found some holdout skilled leather workers as well as nearby high-quality tanneries, where he can hand-select material. He’s developed close working relationships with the mill, which started out with four workers and has grown to nine, and is able to customize product, including Grifter gloves specially designed for bikers with lost fingers and hand deformities. Easily recognizable around town on his freshly painted magenta-and-black striped 2007 Harley “Dyna,” Asher credits his parents for his creative streak. His mother was an excellent cook and an accomplished seamstress who made drapes, bedding, and his clothes, and his father was a television producer and one-time actor. Asher’s also grateful for the power of social media and some lucky breaks along the way: chance meetings with folks who led to valuable contacts with press, retailers, and collaborators. “I’ve learned to always say ‘yes’ to meeting someone; you never know where it will lead,” he notes. 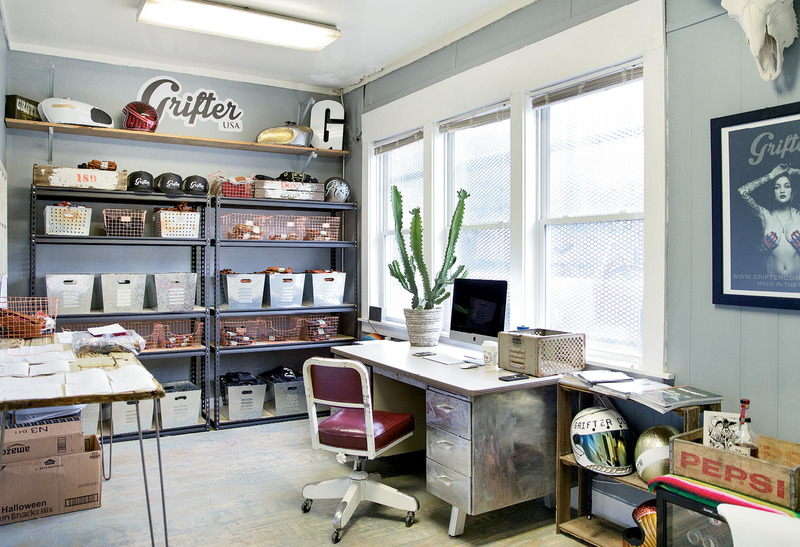 Lucky for the growing community of stylish urban riders and those eyeing snaked-out Chuck Taylors and classy python purses, the future is bright for both Grifter and Taxidermy. A Grifter flagship store in Charleston (featuring other curated custom men’s apparel) is in discussion, as is a small storefront for Taxidermy, but both Asher and Amy are cautious about growing too quickly, keeping their priority on quality control in the forefront. And lucky for the duo, their contrasting brands are bolstered by the complementary strengths each offers the other. “Asher always had a stronger sense of individual style. I was more mainstream, happy to blend in and buy the name-brand item,” says Amy. 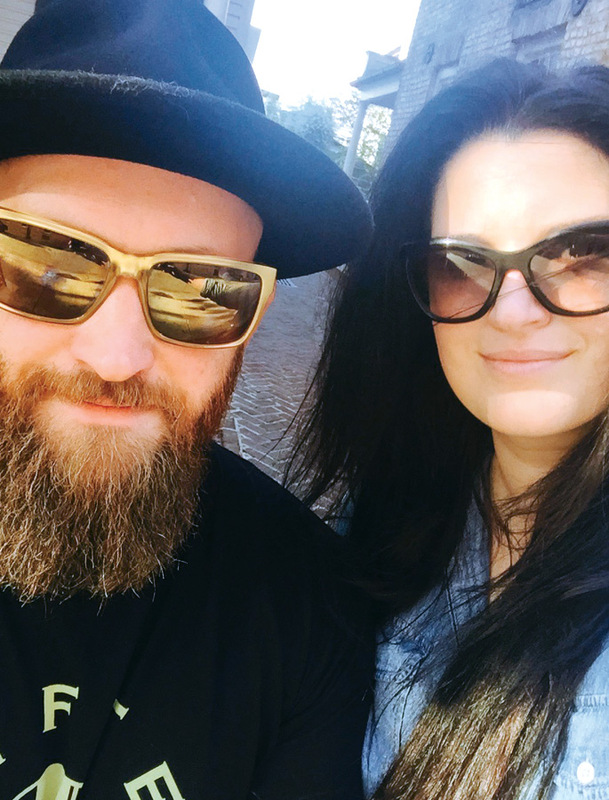 “He’s really pushed me to express my personality.” Amy’s brought invaluable wholesale and fashion design experience, as well as a background in luxury goods and dealing with luxury clients, while Asher’s more honed financial know-how has benefited them both. For this stylish couple, good things (besides Ranger gloves and Luxe Chucks) seem to come in pairs. Take, for example, the day Maxim posted its interview with Asher. Three hours later, the photo of Beyoncé with her Taxidermy bag hit the cybersphere. “We were like, ‘Okay, who’s cooler?’” Amy laughs. “Nope,” Asher corrects, “you’re really competitive.” And there you have it, timeless chic or high velocity hip, we all win.